EPA Education Grants. Missouri River Relief received an Environmental Education Grant from the EPA in 2015. It funded two years of start up for a Missouri River Camp for students 15-18 (upper left - netting riverine forest birds), the first year of an annual Missouri River Rendezvous (upper right - program listing morning presentations), two years of a start up for a Teacher Workshop (lower right -educators boarding a fish-shocking boat to sample asian carp) and $22,750 in small grants for eight environmental education projects in Missouri, Kansas and Nebraska (lower left - community art project in Boonville). Executive Director Jan Weaver provides a short overview of the EPA to help inform the proposal to cut its budget by 31%. What is the EPA's main responsibility? It is to write and enforce regulations based on laws passed by Congress. Eight key laws for which the EPA is responsible are the National Environmental Policy Act (NEPA), the Clean Air Act (CAA), the Clean Water Act (CWA), the Safe Drinking Water Act (SDWA), the Resource Conservation and Recovery Act (RCRA), Comprehensive Environmental Response, Compensation, and Liability Act (CERCLA aka Superfund), the Federal Insecticide, Fungcide and Rodenticide Act (FIFRA), and the Toxic Substances Control Act (TSCA). How does does the EPA accomplish its job? The EPA sets standards for air or water quality or release of pollutants and states and tribes are given the responsibilty of achieving the standards. In Missouri, the Department of Natural Resources is responsible for implementing environmental laws. The EPA also provides grants for research, technical assistance and education that help states, tribes, communities, non-profits and schools to plan and carry out projects to improve their local environments. For example, a state revolving fund helps communities upgrade or replace drinking and waste water treatment systems. 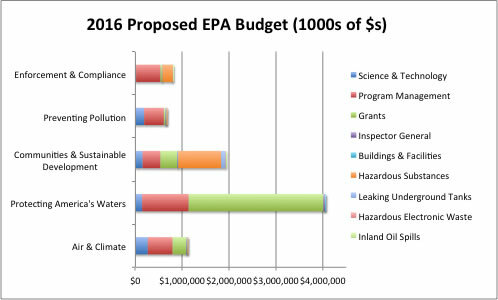 How much does it cost to run the EPA? Its requested budget in 2016 was about $8.6 billion (about 0.24% of total federal budget). About 40% of that was for grants mostly for protecting water quality. Another 42% was for the 17,000 scientists and program managers across all program areas - air, water, communities, pollution and enforcement. See below for budget details. For comparison, Agriculture requested $25 billion in 2016 (4% of the budget) and employs about 95,000 people. Access all of the EPA learning resources here. Join us November 3-4 at the Kansas City Zoo for the 2017 Green Schools and Environmental Education Conference! Networking - Jan sent a reminder about the May 11 MO Environmental Literacy Advisory Board meeting. MELAB is a group of groups who work to advance statewide EE goals. Conference - We are now accepting proposals for the 2017 MOGSEE Conference Nov 3-4 - Nature: Pathways to Learning. DEADLINE June 15 for interactive sessions. A big thanks to the Kansas City Zoo for donating their space for free for our conference! Missouri Green Schools - No updates from last month, but look for an announcement from the Federal Green Ribbon Schools program on Earth Day, April 22. Accounting - Jan worked on the annual 990 EZ for the IRS. Administration - Jan collected and counted ballots and submitted the results to the board, notified the new board members, distributed a board notebook to each, and worked on finding a mutually agreeable time for a board conference call. Trump's budget would cut funding for EPA Science Advisory Panel. A bill currently before congress seeks to add more industry voices to the panel. The EPA decides not to ban a pesticide it decided to ban. Chlorpyrifos, banned under the Obama administration's EPA, will be allowed to stay on the market under the Trump administration. Chris Wallace (Fox News) interviews Scott Pruitt (EPA) about the Clean Power Plan. Wallace asked about the health impacts of not reducing carbon pollution, whether Pruitt thought CO2 caused warming and about specific cuts to the EPA. ~14 minutes. April is packed with clean-up events (category 2 workshops) and Earth Day Celebrations (category 3 workshops). Be sure and check the workshops page for what is happening in your area. Nature has an endless supply of things to count, measure, categorize and sort; of patterns to puzzle out; and of data to record and graph. Check out these activities for using this variety and abundance to build math skills and to deepen ecological understanding.